Y'all know how much I love lamps and lamp light. I mean who wants to sit in the dark? Oh, and don't even get me started on overhead lighting, but sometimes we need to use that, too. When I first saw these new energy saving bulbs years ago I thought OH NOOOOOOO! I was like how do you use a clip on shade with that? How do you use it in a light where it will show. It's so weird looking. I don't like the light they put out either. Since the good old incandescent bulbs will be a thing of the past as soon as they all sell out what are we left with to use? Well, I have good news!! Thank goodness for new technology and these fabulous LED bulbs. I was sent two of these Cree LED light bulbs to try out. When I was contacted about reviewing these bulbs at first I thought no I don't think so and then I was like wait a minute. I turn on a lot of lamps every night and on cloudy days. Turning those on a lot means they burn out and have to be replaced so why not try these out. We all use light bulbs probably every single day and these will last TEN years! When I opened the box and got the bulbs out I was surprised how heavy they are. Then I opened the package and got one out. These are quite different. The bulb is rubbery feeling to the touch and a bit sticky. These stay cool to the touch and don't put out any heat like other bulbs. I have burned my fingers on many a bulb, but you can touch these while they are on with no chance of getting burned. These bulbs contain no mercury and you can dim them. I am thrilled with that since we have a lot of dimmer switches. In some states utility companies are offering Energy Star instant rebates which will make the price a bit better. These do run from around $10 to $20 depending on the wattage. Home Depot is the only store carrying these award winning bulbs. You can find out more info about the bulbs at creebulb.com. I did a little comparison with a regular incandescent bulb and the new Cree bulb in the same wattage. I think you can see that the Cree LED bulb is a bit brighter, but they are definitely not glaring. They even offer different types of white light to choose from. I was sent the soft white. Well, I know everyone can use some new light bulbs and here is your chance to win two of these fabulous bulbs. 2. Like Cree Bulb's facebook page here. Leave a separate comment for each entry. Remember to leave your email address if you don't have a blog so you can be contacted if you win. The giveaway will run through Monday March 3. Good luck and I am going to Home Depot to buy me some more of these! I was given the product to try and all opinions are my own. Good to know Kim! I've been hoarding the old bulbs because I really don't like the regular energy saving bulbs! Gotta try the Cree bulbs on your recommendation! I've been buying the incandescent bulbs, too! Hopefully the Cree' s will be a great alternative, because the other brand's I've seen had such a cold look to them. Thanks for the chance to try them out! Cree Facebook fan now, too! Thanks again for the chance, Kim! I don't care for the swirly light bulbs either. I would love to give these a try. Like you, I don't like the newer bulbs either. These look great and remind me of the old bulbs. I'd love to give them a try! I am going to give these a try. I have never liked the energy saving blubs because of how long it takes a lot of them to get to a full bright light. I hate to walk in a dark room and turn on the lamp and it takes 5 minutes for the blub to get bright. So I will give these a try. Thanks for the chance to win these too. Hope to venture out to Home Depot for these bulbs before the snow storm. Thank you for this giveaway. I've heard about these bulbs. Thanks for the chance to win a couple to give them a try. looks like it's worth a try.....haven't ever liked the slow to come to full brightness aspect! I have not liked the new bulbs in the past, but will try these based on your recommendation Kim. Thanks for the info. I liked Cree on Facebook. And of course I have been a facebook fan of yours forever! I'm off to get some of these awesome sounding light bulbs! This is so timely as my stash of incandescents has finally run out! Does it make any weird noises or flicker when you dim it? That's been the issue I've had with similar bulbs. Maybe I'll win and I can find out on my own! I would love for there to be better light in some rooms of my condo. These look interesting. Thanks for the giveaway. I'm reluctantly switching over to the new bulbs too. I need a touch more light, especially since I just changed my lampshades from 25 year old lampshades to a touch more modern and a darker fabric. LEDs have been a touch too bright and a different light....I would love new! Yes please! Already like Cree on FB! Already "like you" on FB! I think I better look at these next time I'm at The Home Depot. I'd love to try these!! I've been curious about them and we've been hoarding the old ones and are running out! Looks great! I have a stockpile of 40 and 60 watt incandescents, but somehow missed the 75 and 100, and now I'm out! :( I'll definitely be checking into these. I have not seen these yet but will give them a try. I liked Crees facebook page. Liked yours long ago. We've been trying different bulbs. Like that these work with a dimmer. I'll give these a try. Thanks! Thank you for sharing this, Kim. I've been worrying about those new bulbs, and the ugly light they'd cast. I like how you showed that there is no difference in the lighting with the old and this new one. Just showed your post to my Hubby...going to pin this for when we need bulbs. I have just returned from an awesome estate sale where I bought a lamp exactly like yours (well not exactly, exactly). I have always loved yours so much. I need these bulbs to put in my lamp. Good lighting is such a pleasure. Thanks for a chance to try these new bulbs. I hate the "new" lightbulbs also. These sound really neat and I would love to win so I can try it before I buy it. Oh those bulbs are great! We bought one when we bought our light fixture for the kitchen from Home Depot. The salesman sold me on them and when I came home, Jimmy already knew about them. He definitely wants to get more, so I'd love to win this giveaway! They are a great alternative to those other energy saving bulbs. I liked the lightbulb facebook page. I'd like to give them a try! I'd like to try them. Thanks for the giveaway. Thanks for the tutorial, Kim! I am anxious to give these a try! I don't care for the mercury bulbs, either! I would love to try these bulbs. Thanks for sharing. I had not heard of these bulbs. I am definitely going to buy those bulbs. I have lamps that need they will fit. Thanks so much, Kim! Oh, and Happy Belated Anniversary! I was sad to hear of the loss of regular bulbs a few months ago. I have stocked up but would definitely try these new bulbs. I follow Savvy Southern Style on Facebook. I would love to try these. I love that they are not the swirly kind. Wonderful now I won"t have to sit in the dark! Thanks again Kim! I've been very worried about what I'm going to do with all my clip-in lampshades. As always you came to the rescue! This looks like something that would be awesome to try. I've considered buying these, but haven't done so yet, so a giveaway would be perfect! since you gave such a good review on these I guess I will try them I too have clip on lampshades and wondered what to do. Thank you for your review! I would love to win this Cree product!! I am converting our house and this would be a great help. My email is cadobyns@aol.com I do love the shape of these bulbs and the fact that they are not hot to touch. Any bulb that lasts 10 years gets my vote. I liked Cree on FB. I love that these new bulbs don't contain mercury. That they run cool is also a definite plus. I think I need several of these in my home. Thanks for the news on new light bulbs; it's SO confusing...all the different bulbs and I know I don't want to use bulbs with mercury which non LED bulbs have...what's the savings there? I don't want mercury in land fills and then in ground water. Like you, light, light and more light is my motto, especially as my eyes seem to have aged quicker than the rest of me. I've never heard of these bulbs, but thanks for the chance to (maybe) try them. Also a FB follower, under my real name. If you choose this comment, I'll give you my name to check. Thanks for another chance to win. "A modern day Edison has a bright idea: a way to keep the incandescent bulb burning brightly, despite a government law set to go into effect New Year’s Day that effectively outlaws the most commonly used lightbulbs. The 2007 law forces manufacturers to improve the energy efficiency of ordinary bulbs dramatically: 40W bulbs must draw just 10.5W, and 60W bulbs 11W, and incandescents simply can’t do that. But there are a variety of exceptions to that law for specialty lighting, including bulbs with unusual bases, others meant for special display purposes, and rough service bulbs. In 2010 Birnbaum applied for a permit to build them under the new specifications: Per the government, his bulbs needed seven filaments rather than two, a brass base, and 1 millimeter thicker glass, and the bulbs had to be filled with a special mixture of argon and krypton to improve their lifespan. “You’d be shocked how many people still want incandescents,” he told FoxNews.com. I hate to admit it, but I've stockpiled 60 and 100 watt incandescent bulbs because I dislike the new ones so much. These look interesting and I'd love to try them out. Oh, boy, count me in! I found an entire box of regular incandescent bulbs about two years ago at a Goodwill and have been using those. I cannot stand the look of those spiral bulbs poking their snouts out of desk and bed lamps and, as you point out, they've put a lot of lovely lamp shades out to pasture...and the light they emit. Oh, ugh! Please, please, please, I hope I win. THANKS SO MUCH FOR THE INFO ON THE BULBS. I HAVE BEEN UPSET OVER THE SITUATION ALSO. I WILL TRY THESE. This is so good to know - thank you! great improvements; save time and energyWHOOHOO! I'm anxious to see if you get ten years out of these. We were constantly having to replace burnt out bulbs at work, so my boss splurged and bought a couple of these at $20 each. We got maybe a couple of months out of them. I am with you I don't like the new bulbs but I have noticed the soft light is THE WORST yellow light. The bright light version is the best. I am also going to try out the Cree. Thanks for the info. These look great! Thanks for the giveaway. Thanks for a chance to try these new bulbs! My little clip-on shade in the kitchen looks a little wonky on those spiral-shaped bulbs. I'm a FB follower of yours! I would like to try one. I am always looking for the perfect light. 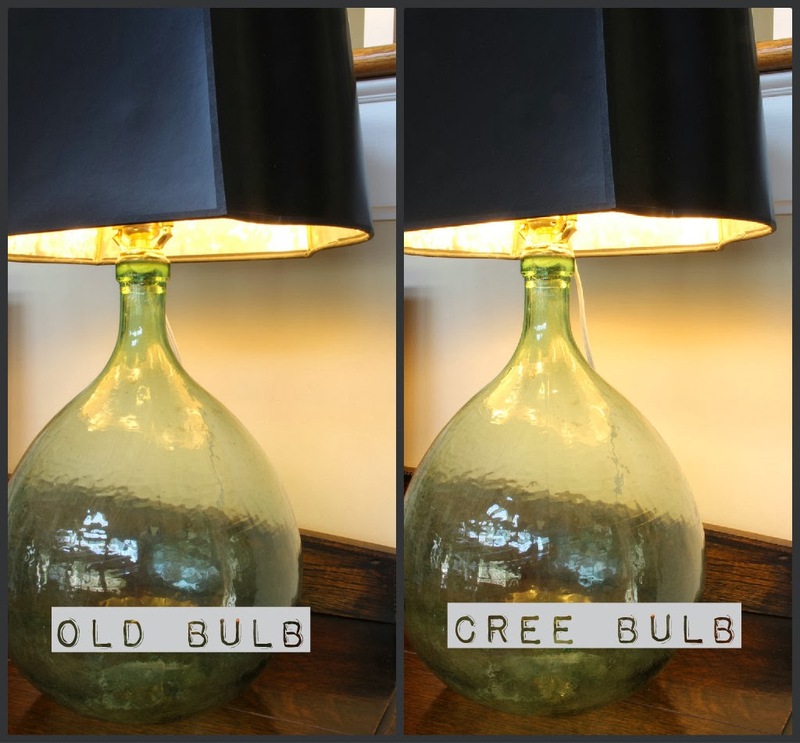 Cree bulbs sound interesting --- would love bulbs that last more than a few months. Thanks for a new giveaway! I like the look of these bulbs! thanks! like you on fb, too. thanks! would actually like to try these out! would like to try these…got some of the "other" bulbs and they are so big around won't fit in my ceiling fixtures! Great giveaway Kim...we use those Cree bulbs all around our house! I have been buying up the old bulbs too cause I also hate the new ones. BUT, since you are recommending these I would love to give them a try!!!!!!!!!! Thanks for the chance, Kim!!! I liked Cree's FB page too. We have had disappointing experience with some "long lasting" bulbs...hope these are better! So glad to see there is another option for light bulbs! Thanks for your recommendation! I will give them a try! I liked SSS on FB. I liked and commented on both pages on FB, thanks for sharing this info and giveaway!!! I just got a new lamp and would love to try out these new bulbs. TY for the chance! I use a lot of fluorescent bulbs, so I would love to try these! I had already liked you on FB! I liked Cree LED bulbs on FB! Darn! Overlooked that I was supposed to leave my email!